A seafood mixture of fish , squid, mussels and shrimp fried in a lightly seasoned batter served with fried yucca and criolla sauce. seafood mixture of fish , squid, mussels and shrimp fried in a lightly seasoned batter served with fried yucca and criolla sauce. (Serves two persons). 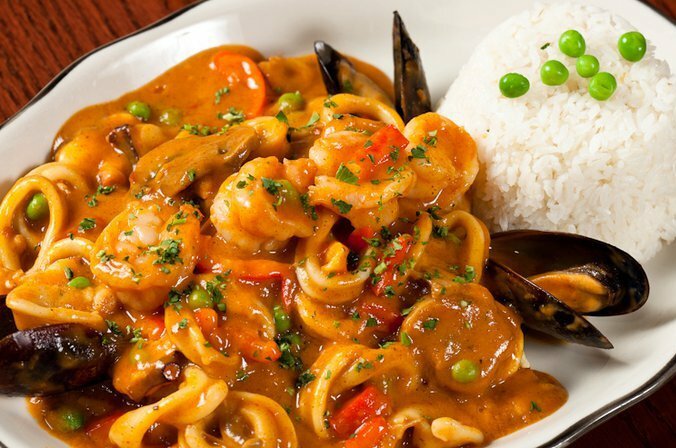 Peruvian style stir-fried with mixed seafood. Peruvian style stir-fried rice with shrimp.
. seafood mix sautéed with spicy rich creamy sauce. Served with white rice. Peruvian style fish fried rice.